The 1757 Battle on Snowshoes was a skirmish fought between Rogers' Rangers and French and Indian troops during the French and Indian War on January 21, 1757. The battle was given this name because the British combatants were wearing snowshoes. On January 21, 1757, Captain Robert Rogers and a band of is rangers were on a scouting expedition near Fort Carillon on Lake Champlain when they were ambushed by a mixed troop of French regulars, Canadian militiamen, and Indians. The fighting ended when darkness set in, with significant casualties on both sides. 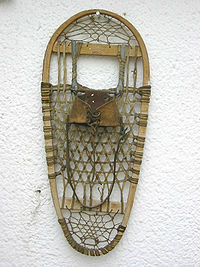 The French in their reports claimed the British had a distinct advantage due to their snowshoes.